Finding a good collection of chamber music (trios and quartets) suitable for young or amateur players can be difficult; the series by Belwin Mills and the older Rubank books are probably the most used. 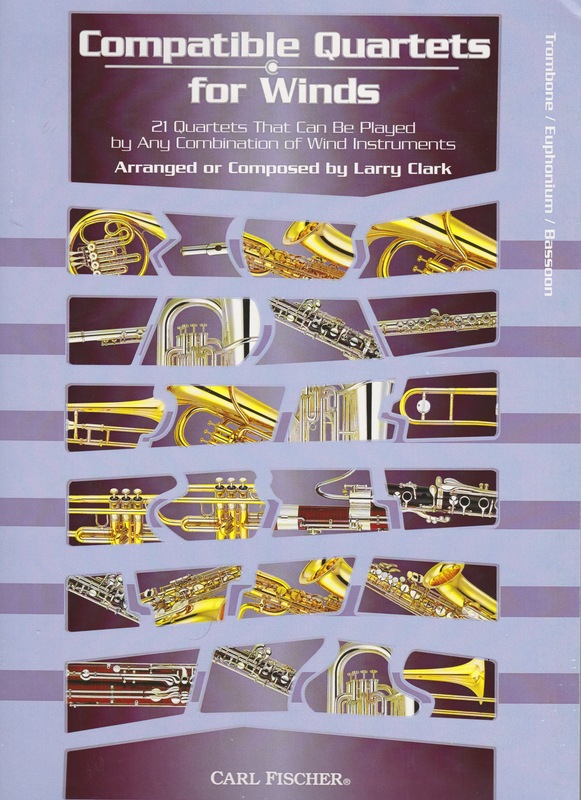 These twenty-one quartets by Larry Clark are thus a welcome addition with one important advantage: the book is part of a collection written so that each piece is playable by any combination of instruments included in the series. Available books include treble clef C (flute, oboe, bells), treble clef B-flat (clarinet, tenor sax, trumpet, euphonium TC), treble clef  E-flat (alto and baritone saxophone), horn, bass clef (bassoon, trombone, euphonium BC), and tuba. Thus a theoretical quartet of trumpet, alto saxophone, trombone, and tuba could use these books. The arrangements are of traditional works by Mozart, Haydn, Handel, and others plus two original pieces by Clark. They are placed in order of difficulty, suitable for third-year players to average high school students or adult amateurs. The arrangements place the melody in the upper part most of the time, allowing the lower parts to be covered by less advanced players. Ranges are moderate, going up to g1 in the first part and down to an F in the bottom part. An F attachment or bass trombone is not required. The music is easy to read and includes articulation and style markings, helpful for players at this level. However, no trombone specific markings are included, alternate positions for example. These books are fine for small ensemble readings and performances with groups of both like and varied instruments. With the increased popularity of adult ensembles such as the U.S. based New Horizons band program, this book is not just for young players. A similar series exists with the three Yamaha Band Ensemble books published by Alfred, but this collection gives another option for the teacher seeking more chamber music possibilities.